It may be bloody and highly controversial, but mixed martial arts will be coming to New York in the not too distant future, and the popular sport will then face the challenge of lining up promoters to meet the requirements contained in the bill passed by the Assembly this week and headed to the governor’s desk. Event promoters will be required to provide at least $500,000 in accident insurance coverage for competitions and they would have to provide fighters with a separate insurance benefit of at least $1 million for the treatment of life threatening brain injuries. 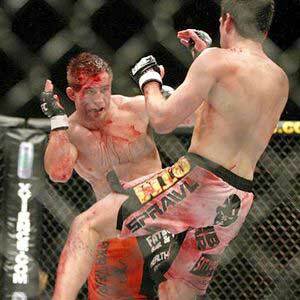 Mixed martial arts&rsquo; contests can be bloody. Mixed martial arts champion A. J. Verel has been involved in the fight to legalize the sport since 1997 and he sees the legalization as the reward for all the effort that has gone into the fight to educate lawmakers and the public. The passage by the Assembly lifts a ban on professional MMA that has been in place in New York since 1997, with New York now becoming the last state to legalize the sport that has many opponents who call it a “nasty” spectacle but realize that it enjoys widespread popularity. This year was the first time in seven years the MMA measure has reached the Assembly floor despite winning passage over the last seven years in the State Senate. Convicted former Assembly Speaker Sheldon Silver had blocked the Assembly from voting on MMA and supporters were hopeful that with Silver now gone, they had a chance for success. They were right.